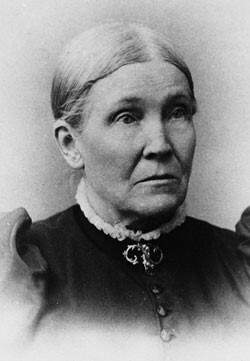 Mary Elizabeth Rollins Lightner 1818-1913 is perhaps best known among Latter-day Saints as the young woman who, with her sister, Caroline, rushed to save unbound sheets of Joseph Smith’s revelations while a mob was tearing down the Church’s printing office in Independence, Jackson County, Missouri. Well, my young brethren, I can say I never was more surprised in my life than to be called upon to speak to you young men who are called upon to go into the mission field to preach the gospel to the nations of the earth. It is true I have been in the Church from its beginning. Just six months after it was organized, I joined it. I have been acquainted with all of those who were first members of this Church, with all of those who saw the plates and handled them, with even those who saw the angel Moroni who came to them. I am well acquainted with every one of them and I have known them from the time that they came to Ohio until their death; and I am the only living witness who was at the first meeting that the Prophet [Joseph Smith] held in Kirtland. The Smith family was driven from New York, and a small church had been organized. Oliver Cowdery, Peter Whitmer, and Ziba Peterson were members. Well, I being anxious, though young, to learn about the plates from those who knew all about it, my mother and I went up to the Smith family the next night after they came to Kirtland. As I went in, there were two or three others present. They were all there, from the old gentleman and his wife to all the sons and daughters. As we stood there talking to them, Joseph and Martin Harris came in. Joseph looked around very solemnly. It was the first time some of them had ever seen him. These words are figured upon my brain and I never took my eye off his countenance. Then he knelt down and prayed. I have never heard anything like it before or since. I felt that he was talking to the Lord and that power rested down upon the congregation. Every soul felt it. The spirit rested upon us in every fiber of our bodies, and we received a sermon from the lips of the representative of God. Address at Brigham Young University, April 14, 1905, typescript, BYU. See also Diary of Mary Elizabeth Rollins Lightner, “Young Womens Journal, XVI, December 1905, p. 556-557. This entry was posted in blessings, Church History, Prophets, Stories from Church History, Testimony, Visions and tagged Joseph Smith, Kirtland experiences, Mary Elizabeth Rollins Lightner, Testimony. Bookmark the permalink.